On November 10, 1972, Bishop George W. Ahr established Saint Justin’s Parish.The Bishop appointed Rev. George E. Deutsch to serve as pastor of this new community. Armed with much faith and confidence in the Lord, Father Deutsch began to gather the community at the East Dover First Aid Building, and at various homes for services and education. Initially, our new parish numbered some 1,070 Catholic families. The numbers and the exuberance of this new parish community immediately underscored the inadequacy of the makeshift accommodations. Father Deutsch sought the Diocese’s approval to build on a 10 acre parcel of land on Fischer Boulevard adjoining Cattus Island Park. The Diocese had acquired this land earlier as a possible site of a second parish in Toms River. On March 11, 1973, Bishop Ahr approved a campaign to raise funds to build a pre-fab Parish Hall and eventually a Church.The steel Parish Hall structure went up quickly and was first used for the celebration of Mass in April 1973. A second steel building was completed in October 1973. 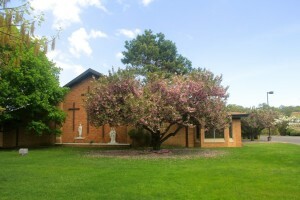 The two buildings provided much needed classroom space for the religious education program and meeting rooms for the growing number of parish organizations and activities.Ground breaking ceremonies for Saint Justin’s Church building were held on April 21, 1974. The new church, with a seating capacity of 600, was completed in October 1974, and it was consecrated by the Bishop on November 2, 1974. The first regular mass was celebrated in the new church on December 19, 1974. After the church building was completed, the parish went on with its planned complex of buildings. The present rectory was completed in July 1975, and the current parish hall was completed in August 1978. The original parish hall was turned over for the youth of the parish as a meeting place and a gym. On November 12, 1982, Father William Nolan was named Pastor of Saint Justin’s. Father Nolan was ordained in 1969, and served at Saint Thomas, Old Bridge; Saint Joseph, Toms River; Saint Rose, Belmar; and Saint Mary’s, New Monmouth, before being named Pastor of Saint Justin’s. As the rapid growth of Toms River continued, it became clear that the Church would have to be enlarged. By January 1987 the parish was up to 3,500 families, and at times, held as many as thirteen Masses on the weekend (8 in the Church, and 5 in the Hall.) At that time there were three parochial vicars serving the parish, along with the pastor. Plans and a building fund were begun in early 1987. On October 11, 1987, hundreds of Saint Justin’s parishioners decorated shovels and broke ground for the 300 seat addition to the Church and a new parish library.On October 1, 1982, it was announced by the Diocese that a third parish was to be established in Toms River. The addition was completed and the newly enlarged 900 seat Church was dedicated by Bishop John Reiss on June 1, 1989, the feast of Saint Justin. Weekend-long activities were held to celebrate. There was a concert by the Ocean County College Community Chorus, tours of the new facilities, a dance, and a parish picnic. On May 1, 2006, Rev. Mark A. Kreder was named Administrator of our parish, and on November 18, 2007, was installed as the Third Pastor of St. Justin the Martyr Parish. Father Mark was ordained on May 17, 2003, and served at St. Mary Parish in New Monmouth from 2003-2005. He then served for ten months at Our Lady of Good Counsel Parish, Moorestown, prior to being assigned to St. Justin’s. Under Father Mark’s guidance and leadership much welcomed renovations and updating took place. A new Baptismal area was created to the left of the Sanctuary in the fall of 2013. In keeping with present church guidelines, the Tabernacle was changed to the center of the Sanctuary on the Feast of Our Lord Jesus Christ King of the Universe, November 24, 2013. A new Sanctuary area with the Crucified Christ, as it’s focal point, was completed in June of 2014. The Resurrected Christ, which adorned our altar, was given a prominent place of honor, with an artistic backdrop, above the doors to the Narthex. This serves as a visual reminder of taking God’s love and mercy with us as we exit the church. Complete renovation of the church commenced on October 6, 2014. Much planning had gone into the interior of the church updating. New porcelain tile flooring, new light oak pews with kneelers, marble tile accents, updated electrical and sound systems were installed. While the renovations were being completed Masses were held in the parish hall. Much to the joy of the parish community all the improvements were completed by the end of November. The first Mass held in our newly renovated church was on the first Sunday of Advent, November 29, 2014. Further improvements in the narthex were completed in January 2016. The old usher closet and unused confessional were replaced with a new State of the Art ADA Compliant restroom facility, and updated usher facilities. March of 2016 saw the renovation of what had been used as a meeting room/library into our St. Justin Conference Room. This beautifully appointed room was renovated with wood cabinets, granite countertop, and equipped with two 55″ wall-mounted television sets. The interior of our church was further beautified by a Holy Family bas-relief sculpture in the early fall of 2016. In February of 2017, the same artist that created the Holy Family sculpture, created a very inspiring stained glass window in our updated (ADA compliant) confessional. As you look at the window, which is a scene from the parable of the Prodigal Son (Luke 15:11-32) the image of the repentant sinner leaning against his father’s breast and the old father bending over his son, represents a symbol of all homecomings, of the darkness of human existence illuminated by tenderness and of weary and sinful mankind taking refuge in the shelter of God’s mercy. This is the grace and mercy we receive in the Sacrament of Reconciliation (Confession). In March 2018 the Evangelist Door was completed, utilizing an existing doorway. This door features plaques dedicated to the four Evangelists: Matthew, Mark, Luke & John. 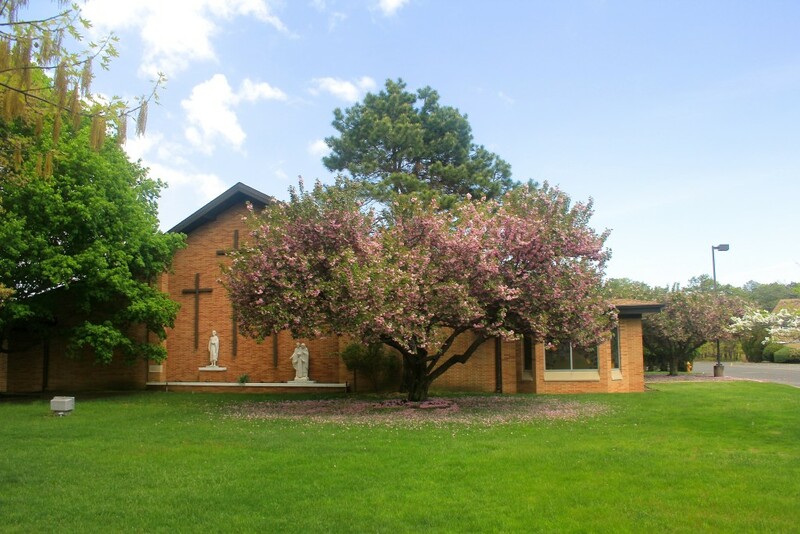 Saint Justin’s Parish serves as the focal point for the spiritual, social, and recreational needs of it’s now 4,500 plus families, with over 19 different parish ministries serving and enhancing all aspects of parish life. The number and variety of parish organizations, activities, and people that make up Saint Justin’s Parish have turned it into a vibrant center for the lives and the affairs of the parishioners and our community.